Jet’s fleet size in 2016-17 was 112, and remained the same in 2017-18. In a market that is registering 20 per cent year-on-year growth, the airline saw no growth in fleet size in the entire year. And this, aviation industry analysts say, is good news. 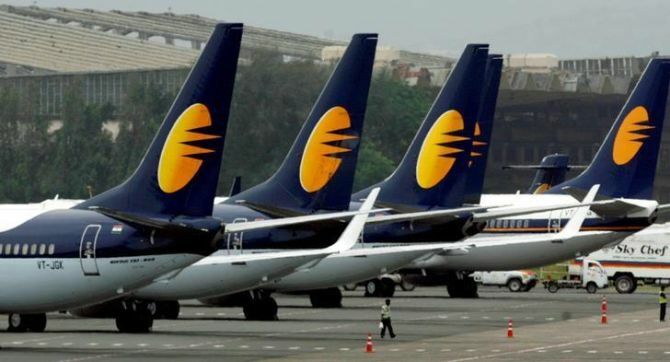 Had Jet added to its fleet, the airline would in all likelihood be staring at a bigger loss than the Rs 767 crore it suffered at the end of FY18. But there is some actual good news. Despite adding no new aircraft, Jet Airways saw more departures during the year, it flew more people, and achieved a higher load and saw an increase in available seat kilometres (askms) and revenue passenger kilometres (RKMs). In other words, the airline used its existing fleet and resources better. Yet the airline lost Rs 767 crore during the year. The fact that the airline used its planes better and improved on all operational parameters tells the whole story in a snapshot. Jet Airways’ cost structure and model are largely unviable. Analysts and aviation experts say that there is no getting away from this for what was once India’s premier private airline, a tag it has lost over the years. There’s no denying the fact that the value of the company has eroded dramatically. In 2005, soon after its listing, Jet Airways was worth $2 billion. Now, a little over a decade later the company is a fraction of that. The airline’s current market capitalisation is roughly Rs 3,250 crore. The airline has the dubious distinction of never touching its issue price again. The current liabilities of the airline are in excess of its current assets by Rs 7,242 crore. The current account on the airline as of March 31, 2018, has Rs 319 crore and cash on hand is Rs 56 lakh, a pittance for an organisation of its size. The bad news is that the airline continued to mismanage things. Though the airline did not add a single plane in the year, it hired 543 people. The employee count rose to 16,558 from 16,015, not taking into account temporary staff. Further, its salary bill is higher than that of most rivals (see chart). 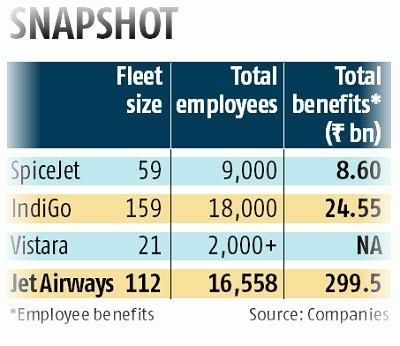 Although the airline has a smaller fleet than IndiGo (112 versus 159), its salary bill was Rs 540 crore higher in the year ended March 31, 2018, something, Jet Airways executives argue, is due to the fact that it is a full-service airline while the others are low-frills carriers. But the argument for most part doesn’t hold water since Jet is unable to command a premium for its higher levels of service and this has been true since the advent of low-fare airlines in India. The airline’s pay structure came under scrutiny after several pilots objected to any kind of pay cut, arguing that if any cuts were required they should be done for the management. A rival airline’s chief executive officer (CEO) told Business Standard that Jet paid three times what it did for people at the same level. Moreover, it has three people instead of one to do the same job! According to the latest balance sheet, Vinay Dube, who joined Jet as CEO in 2017-18, has been paid Rs 10.14 crore in salary and perquisites. Amit Aggarwal, the airline’s deputy CEO and chief financial officer, has received a hike of Rs 1.57 crore in the year (his package has gone up to Rs 5.77 crore at the end of March 2018). Pilots say in contrast the highest-paid pilot in the airline earns Rs 1.3 crore a year. It goes up a bit if one adds the overtime. A senior commander says that it is not the pilots who have mismanaged the airline. He argues that any cuts have to be borne by those in charge of running things. “Suggestions to better utilise the fleet and other improvements suggested by pilots have usually been ignored,” he adds. A former CEO of Jet said while some management positions could not be done away with, the fact remained “all major calls in the airline are taken by the chairman himself, rendering the CEO somewhat irrelevant in some ways”.